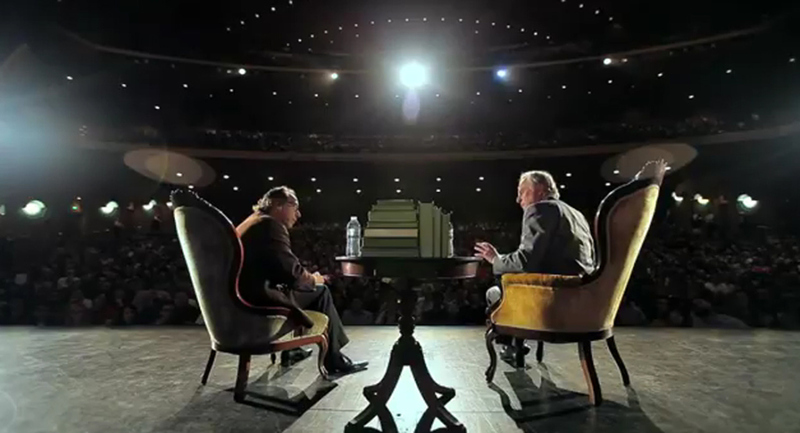 Since 2006 Richard Dawkins and Lawrence Krauss have jointly participated in various public presentations of their shared viewpoints that hold that it would be better if Religion was no longer of relevance as a political or a social force and that Science can provide fully legitimate explanations of The Existence of the Universe and of Mankind here on Earth. A filmmaker named Gus Holwerda has been involved in a project that has chronicled the shared involvement of Richard Dawkins and Lawrence Krauss over several years in their efforts to promote acceptance of Science, and Scientifically accepted truths in preference to Religion, and what are asserted as Religious Truths. 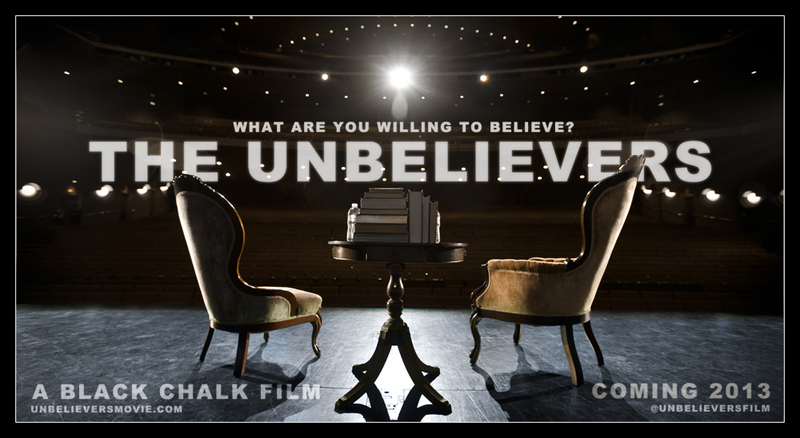 The project has culminated in the preparation for public release of a feature film length documentary presentation, entitled ~ The Unbelievers. Title screen of The Unbelievers film featuring the views of Richard Dawkins and Lawrence Krauss. A promotional trailer to this film was launched in February, 2013 and became widely available on the web. The film includes interviews with celebrities and other influential people who support the work of these controversial speakers. "Which is more important - to explain science or to destroy religion"? The trailer moves on before Dawkins answer can be heard. Just prior to the world premiere of ~ The Unbelievers ~ held in Toronto, Canada, on Monday, April 29, 2013, Richard Dawkins, now an Emeritus Professor having retired from his former post at Oxford University, and Lawrence Krauss, currently director of the Origins Institute at Arizona State University, were jointly interviewed by the influential, Toronto-based, Globe and Mail newspaper. Is there a risk that by challenging religion head-on you galvanize your opposition? "At some level that may be true, but what it does do is point out a key fact: that religion shouldn't have a free ride. Somehow people get the sense that religion is sacred - if you'll forgive the pun - and nothing should be sacred. Everything is subject to discussion and that's what makes life worthwhile." Aren't there important things that we can all draw from religion, like a sense of community or consolation in difficult times? "We can find fellowship and community in other settings, of course. I think it's an odd thing to encourage people to get consolation from something for which there's no evidence. Science, of course, provides it's own consolation - the consolation of knowing what it's all about. This is something uplifting." On the morning of Monday, April 29, 2013 Richard Dawkins and Lawrence Krauss appeared on the Canadian based Global News channel's The Morning Show to talk about The Unbelievers. The documentary follows evolutionary biologist Richard Dawkins and theoretical physicist Lawrence Krauss as they travel the world promoting the importance of science and reason in the modern world. "If something is comforting, that's great, but it doesn't make it true," says Dawkins, arguably the world's most famous atheist. "There are people who sincerely seem to think that because something is consoling or comforting that therefore it's got to be true. That just isn't logical." The pair specifically targets religion and faith. Krauss, who was raised in Toronto, said the goal is not to make people feel bad about believing in God. "We recognize that all of us need comfort in different ways," he explains. "What we're just trying to encourage people to do is get comfort from the real world." "We're not trying to take something away. We're trying to add the wonder of reality, the poetry of the real universe, and say 'you can get solace and wonder from the real world.' It's true, you can get comfort from religion but that doesnt say you have to have religion to get comfort." Dawkins hopes The Unbelievers will spark more debate and, perhaps, open a few minds. "Science is wonderful, truth is wonderful, reality is wonderful," he says. "People need to appreciate reality and not hide behind the smokescreen of superstition." Krauss says there's hope, noting interest in religion is on the decline. "More and more people are coming to realize that they can think for themselves," says Krauss. "It's amazing to discover that you're wrong. In fact, it's liberating. It's not a threat. It opens your mind." "You will hear things like, "Science doesn't know everything." Well, of course science doesn't know everything. But, because science doesn't know everything, it doesn't mean that science knows nothing. Science knows enough for us to be watched by a few million people now on television, for these lights to be working, for quite extraordinary miracles to have taken place in terms of the harnessing of the physical world and our dim approaches towards understanding it. And as Wittgenstein quite rightly said, 'When we understand every single secret of the universe, there will still be left the eternal mystery of the human heart.'" Key insights, from such formidably authoritative "Traditional" sources as the Great Faiths, Plato, Socrates, Pythagoras, and Shakespeare, supportive of such a "Tripartite" view of Human Nature are available here at Age-of-the-Sage. Believe it, or believe it not, Modern Psychological Science also gives some support to such a "Tripartite" view of Human Nature!!! In Philosophy "Metaphysics" is the branch of Philosophy dealing with "being": how things exist, what things really are, what essence is, what it is 'to be' something, etc. The word comes from a "book" of some thirteen treatises written by Aristotle which were traditionally arranged, by scholars who lived in the centuries after Aristotle's life-time in the fourth century B.C., after those of his "books" which considered physics and natural science. The principal subject of Aristotle's thirteen treatises is "being qua being", or being understood as being. What is existence, and what sorts of things exist in the world? How can things continue to exist, and yet undergo the change we see about us in the natural world? And how can this world be understood? It may be that for want of other terminology directly suited to reference such elusive subject matter the term MetaPhysica, (in Greek it means "after physics" or "beyond physics"), was adopted in relation to Aristotle's "book" of "metaphysical" treatises. Human Nature may well continuously underpin, and enduring tend to formatively determine, the operation of many, non-doctrinaire, Human Societies!!! ... Moreover, when we have all the elements, I mean all the essential elements, their mutual relations do, as it were, discover themselves. We draw from the nature of these different elements, if not all their possible relations, at least their general and fundamental relations. We have prepared some fairly detailed, but hopefully entertaining, pages about several most informative episodes in European History in the spirit of attempting to learn worthwhile lessons of history about ~ The Human Condition!!! Do similarities across Inter-faith Spirituality establish some Proof of the Existence of God? Coexistence ~ Faith, Reason, God, Science, Religion, Evolution? Reconcile ~ Faith, Reason, God, Science, Religion, Evolution! Can God, Science, Religion & Evolution be compatible? How achievable is coexistence between Religions & Faiths?